Craig and the other three girls dropped Maddie and me off at St. Louis’ Union Station early on Thursday morning. 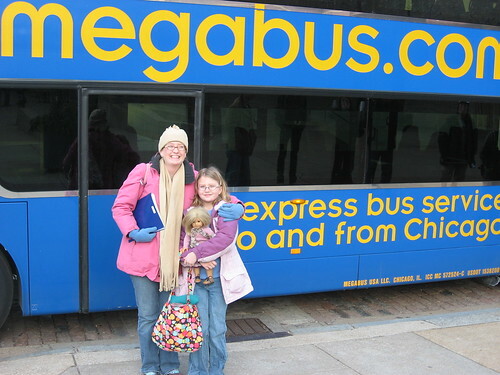 We’d heard good things about the Megabus from friends; the tickets were cheap, so that’s the option we chose. It was great all the way to Chicago. Coming home, however, will be a story for the post on Day 3. 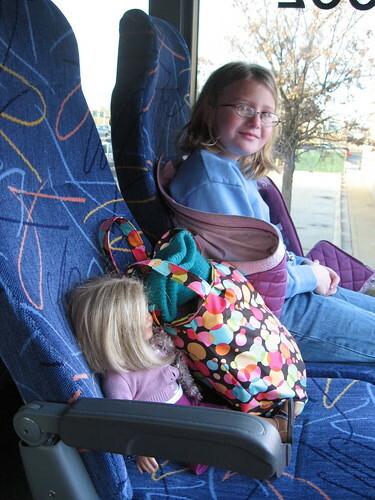 Maddie wanted to sit in the front seat of the top deck of the bus, so that’s where we were the whole way to Chicago. We didn’t have a lot of plans for Thursday other than simply getting to Chicago, so I checked into Navy Pier and sure enough they were doing something. 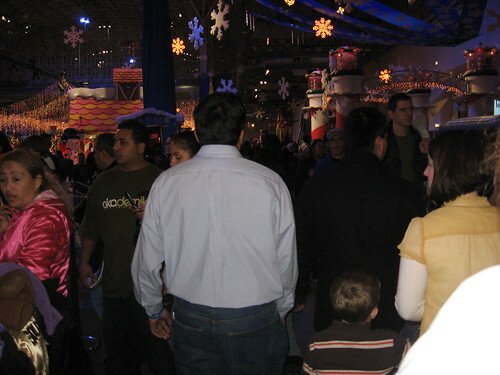 They had a Winter Wonderland inside with lots of things to do – rides, ice skating, etc. We went. It was extremely crowded, so we chose not to buy the $12 wristbands for the rides (there were lines at every station, 30 minutes deep); instead, we just walked around and watched everyone else do it. 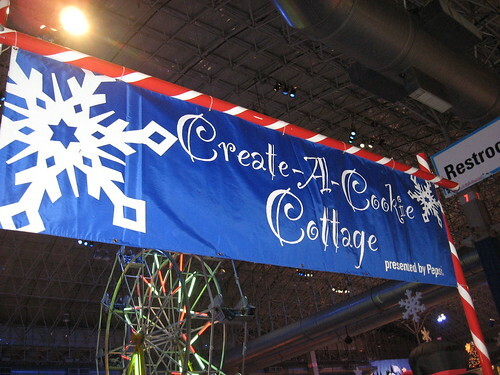 Then we walked by the Create-a-Cookie station. 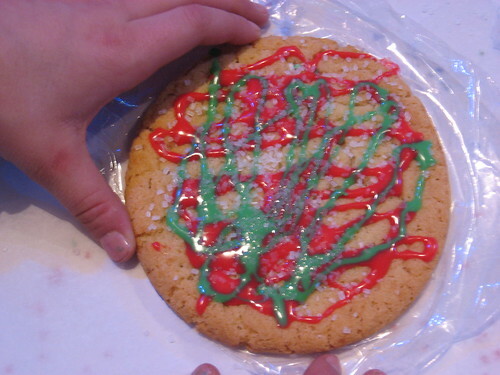 For $2 they give you a sugar cookie and you take it to a table with squeeze bottles full of red, green, and white icing, as well as tubs of sugar sprinkles. Maddie made one. We tried to walk around some more, but mostly saw the crowd. 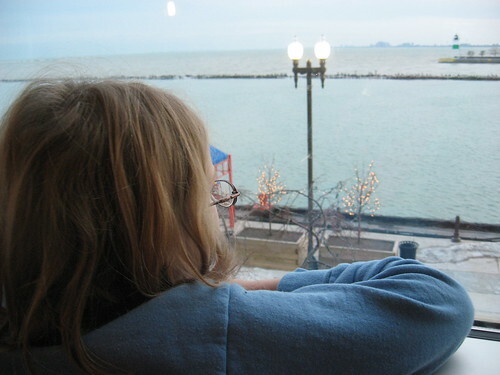 We stared out the window at what looked to be a very cold Lake Michigan. 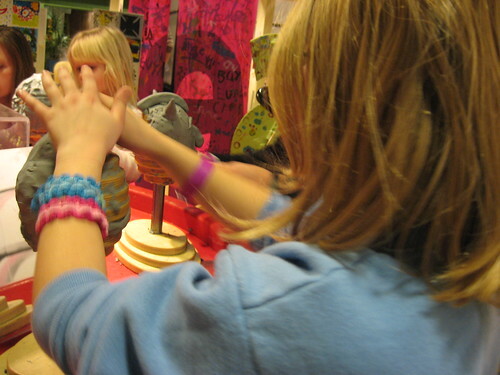 We then went to the Chicago Children’s Museum and got in free with our St. Louis Science Center membership. We sculpted. 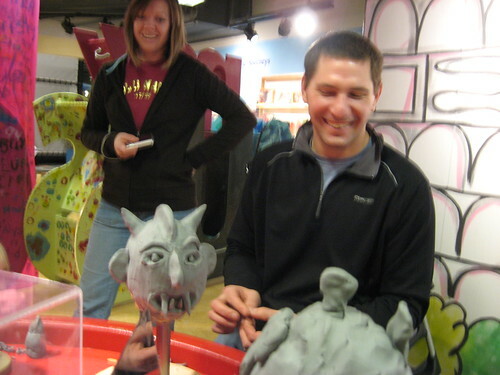 We (okay, I) made fun of the man sitting next to us who was sculpting scary monsters in an attempt to traumatize small children at the Chicago Children’s Musuem. 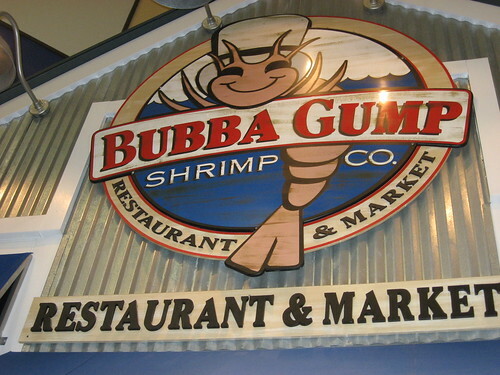 We went to the Bubba Gump Shrimp Co. for dinner (Maddie is a shrimp fan). 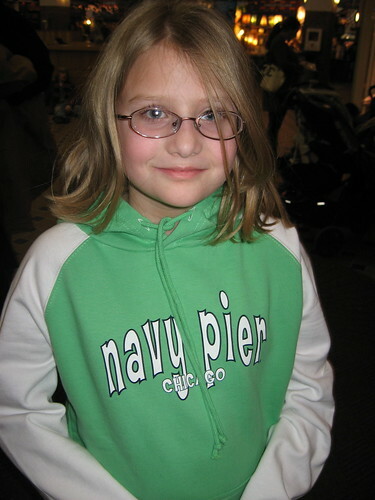 We purchased the obligatory Navy Pier/Chicago sweatshirt. We then walked back to our hotel. From there, we talked a lot about the upcoming years, what she can expect to happen to her as she develops and all that. We tried to go to sleep about 9:30, but had some neighbors having a party in the room next to us. I like to be a good neighbor and all, but an hour later I finally called the desk on them (I had to call twice before they sent someone up and it quieted down soon after that). And that was Day 1 of our Chicago Adventure. Well I’m eager to hear about your bus ride home experience. We live in St. Louis and my dh has tried to talk me into doing the bus deal – but I’ve been apprehensive about it. M10 looks like a young lady in her new Navy Pier Sweatshirt. Tell her I like that green color. What a great memory you all will have from this trip. I can’t wait to do this trip with my daughter! Looks like tons of fun, Megan. This looks like so much fun. I would love to get away with one of the kids for one-on-one like that!! Boy oh boy, does she look like you in that picture on the bus. We love the Mega-bus. We take it from Columbia to STL for about $8.00. We were just in Chicago and my daughter and I took the train back. I know you have had some bad experience with Amtrak but we had a great (if somewhat dull) ride to STL and then Jefferson City. Hey, Megan! Looks like fun times. I’d love for our family to get up to Chicago one more time before we move. We’ll see……. Thanks for the reminder that your blog is now here! I had forgotten to update my google reader! I knew something was missing from my day!